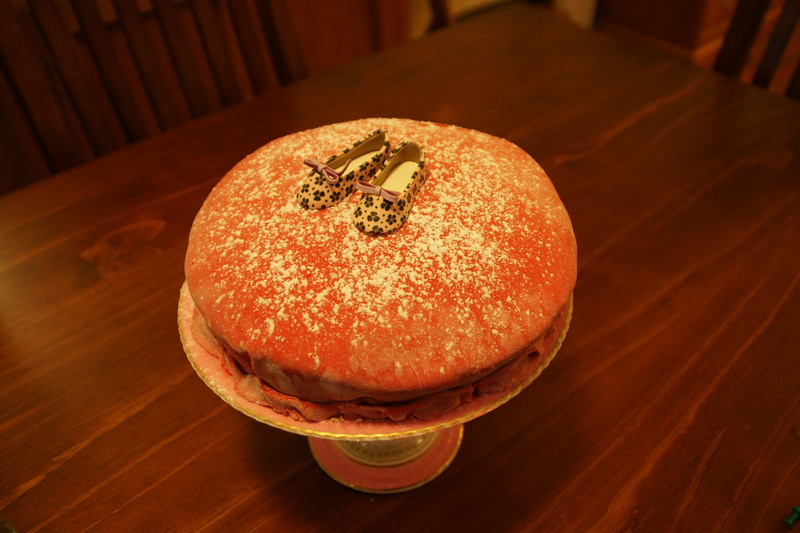 Korena of Korena in the Kitchen was our May Daring Bakers’ host and she delighted us with this beautiful Swedish Prinsesstårta! 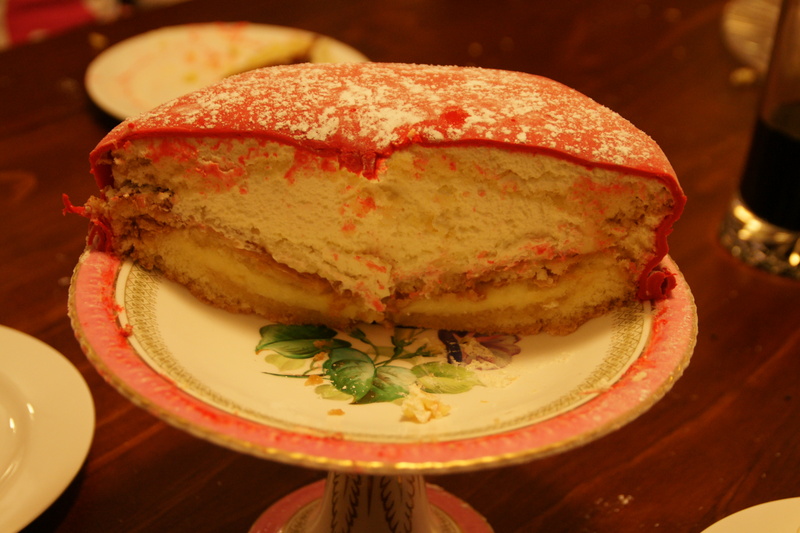 Korena described it as layers of light sponge cake, raspberry jam, and vanilla custard/pastry cream, topped with a mound of fluffy whipped cream, covered in green marzipan, and garnished with a marzipan rose. Korena’s cake was a beautiful, perfectly rounded dome, covered in smooth green marzipan. It probably won’t surprise anyone to hear that mine was somewhat different. 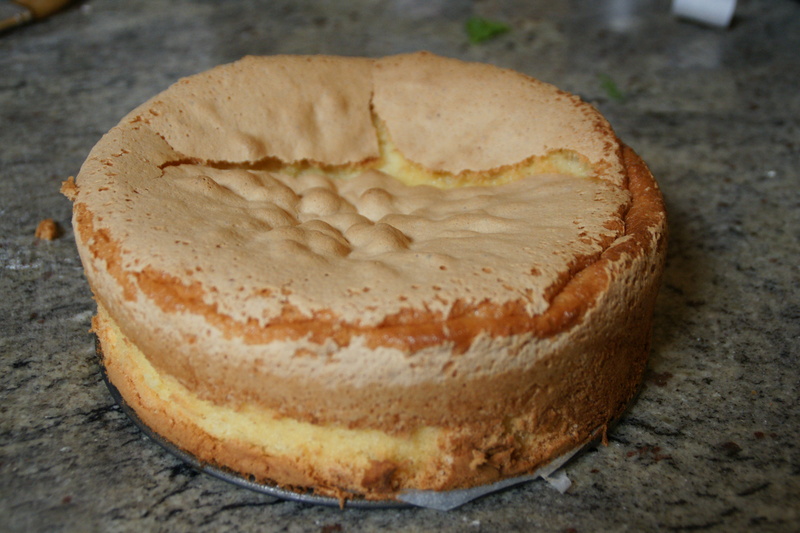 The sponge cake was actually one of the better sponges I have made, which isn’t saying much as I’ve never made one that didn’t end up basically flat. The instructions said not to worry if it cracked, so I didn’t when it did. The next step was to layer cake, then jam, then custard, then cake, jam, custard, then mound firmly whipped cream into a dome shape and drape the inner layer of cake (the sponge was cut into three layers) over that dome. The entire creation then gets covered with cream. Apparently it was meant to be symmetrical. Yeah…I think I probably made it harder for myself by constructing it on a cake stand which was indented, so I was already fighting gravity. But there’s a fairly good chance it would have been dodgy in any event, so I won’t blame the stand (isn’t it pretty, by the way? It was my Gaga Alma’s). The “smooth, regular dome shape” was then carefully covered with marzipan which had been carefully tinted green. 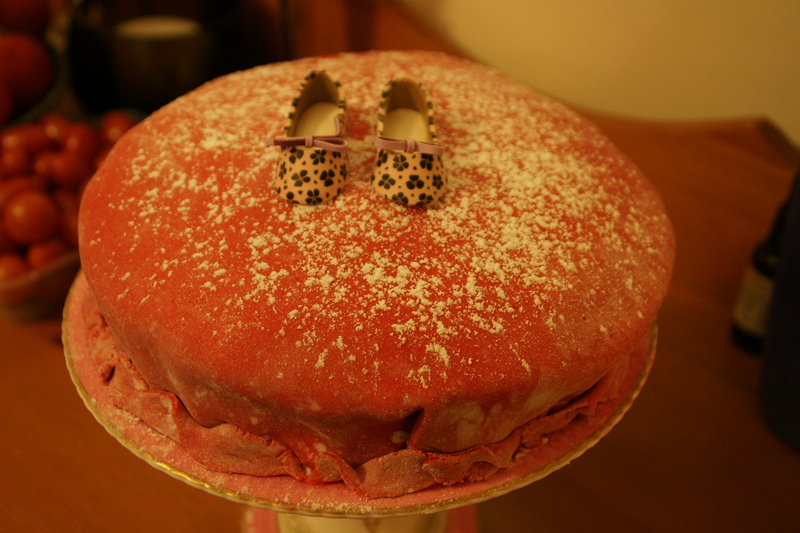 I hate marzipan and am lazy so used some ready-rolled red fondant I had left over from the fire engine cake. I put some decorative shoes on top because the cake was partly to celebrate the speedy (and annoyingly skinny, as he seems to be getting leaner at the same rate I am getting fatter) husband’s equal PB in the Sydney Morning Herald Half Marathon that morning. OK, so he didn’t run in pretty ballet flats, but he did run in shoes. A tenuous link, but I’m going with it. Let the cake cool in the pan for a few minutes then run a knife around the edge and remove the sides of the springform pan. Don’t worry if it sinks a bit in the middle. Invert the cake onto a cooling rack and peel off the parchment paper. If the cake is lopsided, press gently to make it level, then allow it to cool completely before continuing. The cake can be made a day ahead and stored, well-wrapped in plastic, at a cool room temperature. Thanks Korena for dragging me out of my comfort zone! That sponge looks fab! Where did you get those adorable shoes from? Brilliant work lady. I too am useless with sponge and really only like it in lamingtons where failbaking can be hidden! These princess shoes are really cute! Oh man, those shoes are too cute! And beautiful cake stand, too. 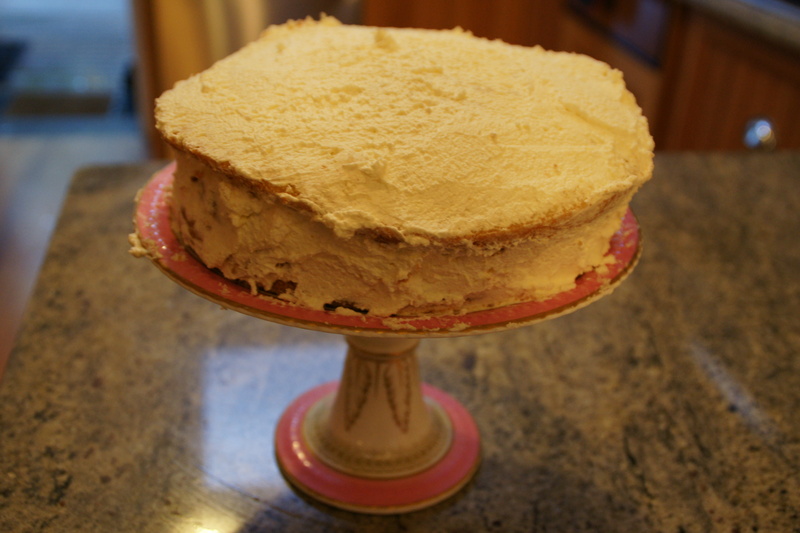 I’m so glad you liked the sponge cake – I was pretty impressed with it too, so light! Thanks for baking with me this month!